Edward R. Murrow (born Egbert Roscoe Murrow) (April 25, 1908 – April 27, 1965) was an American journalist and television and radio figure who reported for CBS. Noted for honesty and integrity in delivering the news, he is considered among journalism's greatest figures. He first came to prominence with a series of radio news broadcasts during World War II, which were followed by millions of listeners in the United States and Canada. Murrow hired a top-flight cadre of war correspondents and his broadcasts were both detailed and dramatic, influencing public opinion significantly regarding the war. As an American, he could speak clearly to the American public, who could readily identify with him. Yet he was an American who identified himself with Britain, understanding the importance of that nation to the future history of the world. And he recognized the power of the medium of communication that he served in bringing his understanding to others. A pioneer of television news broadcasting, Murrow's work continued to bring information to the public in candid yet accurate reports. He is especially well-known for his series of television news reports that helped lead to the censure of U.S. Senator Joseph McCarthy in the 1950s. Murrow's exemplary career remains one of the cornerstones of broadcast journalism, and his widely-agreed status as broadcasting's greatest journalist has not waned in the decades since his death. Egbert Roscoe Murrow, later known as Edward R. Murrow, was born on April 25, 1908, near Greensboro, in Guilford County, North Carolina, to Quaker parents, the youngest of three brothers. He was a "mixture of English, Scots, Irish, and German" descent. His home was a log cabin without electricity or plumbing on a farm bringing in only a few hundred dollars a year from corn and hay. When Murrow was six, his family moved to the state of Washington, homesteading thirty miles from the Canadian border, in Blanchard, Washington. He attended high school in nearby Edison, becoming president of the student body in his senior year and excelling on the debating team. He was on the Skagit County championship basketball team. By that time, the teenage Murrow was going by the nickname "Ed." During his second year of college Murrow changed his name from Egbert to Edward. In 1926, he enrolled in Washington State College in Pullman, Washington, eventually majoring in speech. A member of the Kappa Sigma fraternity, Murrow was also active in college politics and in 1929, while attending the annual convention of the National Student Federation of America, gave a speech urging college students to become more interested in national and world affairs which led to his election as president of the federation. He moved to New York after graduating in 1930. Murrow worked as assistant director of the Institute of International Education from 1932 to 1935, serving as the Assistant Secretary of the Emergency Committee in Aid of Displaced Foreign Scholars, which helped prominent German scholars (mostly Jews) who had been dismissed from academic positions. He married Janet Huntington Brewster on March 12, 1935. Their son, Charles Casey, was born November 6, 1945, in West London. Murrow was a heavy smoker all his life, and was rarely seen without a cigarette, smoking around 60 to 65 a day. His show, See It Now, was the first television program to have a report about the connection between smoking and cancer. Murrow said during the show that, "I doubt I could spend a half hour without a cigarette with any comfort or ease." He developed lung cancer and lived two years after an operation to remove his left lung. Murrow died at his home on April 27, 1965, two days after his 57th birthday. Upon his death, Murrow's colleague and friend Eric Sevareid said of him, "He was a shooting star; and we will live in his afterglow a very long time." CBS carried a memorial program, which included a rare on-camera appearance by William Paley to honor Murrow. Murrow joined CBS—then known as the Columbia Broadcasting System—as director of talks in 1935, and remained with the network for his entire career in broadcast journalism. Murrow's job was to line up newsmakers who would appear on the network to talk about the issues of the day. At that time, CBS did not have a news staff, save for newscaster/announcer Bob Trout. Murrow was intrigued by Trout's on-air delivery, and Trout gave him tips on how to communicate effectively on the radio. In 1937, Murrow went to London to serve as the director of CBS's European operations. The position did not involve on-air reporting; rather, his job was persuading European figures to broadcast over the CBS network, which was in direct competition with the NBC (National Broadcasting Company)'s two radio networks. In this role, Murrow recruited journalist William L. Shirer to take a similar post on the Continent. The two men would become the progenitors of broadcast journalism. Murrow gained his first glimpse of fame during the March 1938 Anschluss, in which Adolf Hitler engineered the annexation of Austria by Nazi Germany. While Murrow was in Poland arranging a broadcast of children's choruses, he got word from Shirer of the annexation—and the fact that Shirer could not get the story out through Austrian state radio facilities. Murrow immediately sent Shirer to London, where he delivered an uncensored, eyewitness account of the Anschluss. Murrow then chartered a plane to fly from Warsaw to Vienna, so he could take over for Shirer. At the request of CBS-New York, Murrow and Shirer put together a "European News Roundup" of reaction to the Anschluss, which brought correspondents from various European cities together for a single broadcast. The March 13, 1938 special, hosted by Trout in New York, included Shirer in London (with Labour MP Ellen Wilkinson), reporter Edgar Ansel Mowrer of the Chicago Daily News in Paris, reporter Pierre J. Huss of the International News Service in Berlin, and Senator Lewis B. Schwellenbach in Washington, D.C. Another reporter, Frank Gervasi in Rome, was unable to find a transmitter to broadcast reaction from the Italian capital, but telephoned his script to Shirer in London, who read it on the broadcast. Murrow himself reported live from Vienna, in the first on-the-scene news report of his career: "This is Edward Murrow speaking from Vienna… It's now nearly 2:30 in the morning, and Herr Hitler has not yet arrived." The broadcast was considered revolutionary at the time. Featuring multi-point, live reports in the days before modern technology (and without each of the parties necessarily being able to hear one another), it came off almost flawlessly. The special became the basis for the World News Roundup—broadcasting's oldest news series, which still runs each weekday morning and evening on the CBS Radio Network. In September 1938, Murrow and Shirer were regular participants in CBS's coverage of the crisis over the Sudetenland in Czechoslovakia, which Hitler coveted for Germany and eventually won in the Munich Agreement. Their incisive reporting heightened the American appetite for radio news, with listeners regularly waiting for Murrow's shortwave broadcasts, introduced by analyst H.V. Kaltenborn in New York saying, "Calling Ed Murrow… come in Ed Murrow." During the following year, leading up to the outbreak of World War II, Murrow continued to be based in London. William Shirer's reporting from Berlin brought him national acclaim, and a commentator's position with CBS News upon his return to the United States in December 1940. (Shirer would describe his Berlin experiences in his best-selling book, Berlin Diary.) When the war broke out in September 1939, Murrow stayed in London, and later provided live radio broadcasts during the height of the London Blitz. Those broadcasts electrified radio audiences as news programming never had before. Previously, war coverage had mostly been provided by newspaper reports, along with newsreels seen in movie theaters; earlier radio news programs had simply featured an announcer in a studio reading wire service reports. Murrow's reports, especially during the Blitz, began with what became his signature opening, "This is London." Murrow delivered it with his vocal emphasis on the word this, followed by the hint of a pause before the rest of the phrase. Murrow achieved great celebrity as a result of his war reports. They led to his second famous catch phrase. At the end of 1940, with every night's German bombing raid, Londoners who might not necessarily see each other the next morning often closed their conversations not just with "so long," but with "so long, and good luck." The future British monarch, Princess Elizabeth, said as much to the Western world in a live radio address at the end of the year, when she said "good night, and good luck to you all." So, at the end of one 1940 broadcast, Murrow ended his segment with "Good night, and good luck." Speech teacher Anderson insisted he stick with it, and another Murrow catch phrase was born. You burned the city of London in our houses and we felt the flames… You laid the dead of London at our doors and we knew that the dead were our dead… were mankind's dead without rhetoric, without dramatics, without more emotion than needed be… you have destroyed the superstition that what is done beyond 3,000 miles of water is not really done at all. The Japanese attack on Pearl Harbor occurred less than a week after this speech, and the U.S. entered the war as a combatant on the Allied side. Murrow flew on Allied bombing raids in Europe during the war, providing additional reports from the planes as they droned on over Europe (recorded for delayed broadcast). Murrow's skill at improvising vivid descriptions of what was going on around or below him aided the effectiveness of his radio broadcasts. As hostilities expanded, Murrow expanded the CBS news staff. The result was a group of reporters acclaimed for their intellect and descriptive power, including Eric Sevareid, Charles Collingwood, Howard K. Smith, Mary Marvin Breckinridge, Cecil Brown, Richard C. Hottelet, Bill Downs, Winston Burdett, Charles Shaw, Ned Calmer, and Larry LeSueur. Many of them, Shirer included, were later dubbed "Murrow's Boys"—despite Breckinridge being a woman. After the war, Murrow recruited journalists such as Alexander Kendrick, David Schoenbrun, Daniel Schorr, and Robert Pierpoint into the circle of the Boys, as a virtual "second generation," though the track record of the original wartime crew set it apart. I pray you to believe what I have said about Buchenwald. I have reported what I saw and heard, but only part of it. For most of it I have no words…. If I've offended you by this rather mild account of Buchenwald, I'm not in the least sorry. April 15, 1945. The relationship between Ed Murrow and Bill Shirer ended in 1947, in one of the great confrontations of American broadcast journalism, when Shirer resigned from CBS. The dispute started when J. B. Williams, maker of shaving soap, withdrew its sponsorship of Shirer's Sunday news show. CBS, of which Murrow was then vice president for public affairs, did not find Shirer another sponsor and allowed the show to keep running on a "sustaining" (non-sponsored) basis, which resulted in a loss of income for its moderator. Murrow and Shirer never regained their close friendship. The episode hastened Murrow's desire to give up his network vice presidency and return to newscasting, and foreshadowed Murrow's own problems to come with his friend and CBS boss, William S. Paley. Murrow and Paley had become close when the network chief himself joined the war effort, setting up Allied radio outlets in Italy and North Africa. After the war, he would often go to Paley directly to settle any problems he had. "Ed Murrow was Bill Paley's one genuine friend in CBS," noted Murrow biographer Joseph Persico. 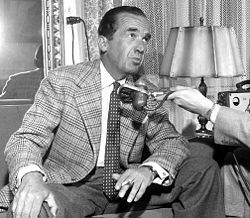 April 8, 1956: CBS newsman Edward R. Murrow talking to reporters during a stop in Wiesbaden, Germany. In 1950, Murrow narrated a half-hour radio documentary called The Case for the Flying Saucers. It offered a balanced look at unidentified flying objects, a subject of widespread interest in the early 1950s. Murrow interviewed both Kenneth Arnold (whose 1947 report kick started interest in UFOs) and astronomer Dr. Donald Menzel (who argued that UFO reports could be explained as people misidentifying prosaic phenomena). From 1951 to 1955, Edward R. Murrow was the host of This I Believe, which was revived on Radio Luxembourg as a program with British hosts from 1956 to 1958 and which was revived in 2005 by National Public Radio and in 2007 by the Canadian Broadcasting Corporation. 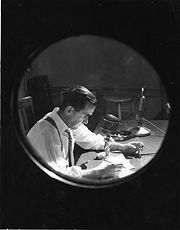 Murrow continued to present daily radio news reports on the CBS Radio Network until 1959. He also recorded a series of spoken-word historical albums called I Can Hear It Now, which inaugurated his partnership with producer Fred W. Friendly. The records evolved into the weekly CBS Radio show Hear It Now, hosted by Murrow and co-produced by Murrow and Friendly. As the 1950s began, Murrow began appearing on CBS Television, in editorial "tailpieces" on the CBS Evening News and coverage of special events. This came despite his own misgivings about the new medium and its emphasis on pictures rather than ideas. On November 18, 1951, the Hear It Now format Murrow and Friendly pioneered on radio moved to television as See It Now. After the pre-title sequence and introduction, viewers saw and heard host Murrow, with a knowing smile, explain, "This is an old team, trying to learn a new trade." In 1953, Murrow launched a second weekly TV show—a series of celebrity interviews entitled Person to Person. Just as Murrow had nearly single-handedly pioneered TV news journalism, with Person to Person he also set the standard for celebrity interviews, producing a format that is still followed. See It Now focused on a number of controversial issues in the 1950s, but it is best remembered as the show that criticized the Red Scare and contributed to the political downfall of Senator Joseph McCarthy. On March 9, 1954, Murrow, Friendly, and their news team produced a thirty minute See It Now special entitled "A Report on Senator Joseph McCarthy." Murrow used excerpts from McCarthy's own speeches and proclamations to criticize the senator and point out episodes where he had contradicted himself. Murrow knew full well that he was using the medium of television to attack a single man and expose him to nationwide scrutiny, and he was often quoted as having doubts about the method he used for this news report. Murrow and his See It Now co-producer, Fred Friendly, paid for their own newspaper advertisement for the program; they were not allowed to use CBS' money for the publicity campaign or even use the CBS logo. Nonetheless, this 30-minute TV episode contributed to a nationwide backlash against McCarthy and against the Red Scare in general, and it is seen as a turning point in the history of television. The broadcast provoked tens of thousands of letters, telegrams, and phone calls to CBS headquarters, running 15 to 1 in favor of Murrow. In a Murrow retrospective produced by CBS for the A&E Network series, Biography, Friendly noted how truck drivers pulled up to Murrow on the street in subsequent days and shouted "Good show, Ed. Good show, Ed." Afterwards, Murrow offered McCarthy a chance to appear on See It Now to respond to the criticism that was given to him on the program. McCarthy accepted the invitation and made an appearance on See It Now three weeks later. However, McCarthy's rebuttal to Murrow only decreased his popularity, already fading, even further. The weekly version of See It Now ended in 1955, after sponsor Alcoa withdrew its advertising, but the show remained as a series of occasional TV special news reports that defined television documentary news coverage. Despite the prestige, CBS had difficulty finding a regular sponsor, since the program aired intermittently in its new time slot and could not develop a regular audience. In 1956, Murrow took time to appear as the on screen narrator of a special prologue for Michael Todd's epic production, Around the World in 80 Days. Although the prologue was generally omitted on telecasts of the film, it was included in home video releases. Murrow's reporting brought him into repeated conflicts with CBS and especially Paley, a contretemps that Friendly summarized in his book Due to Circumstances Beyond our Control. See It Now ended in summer 1958, after a clash between Murrow and Paley in Paley's office. 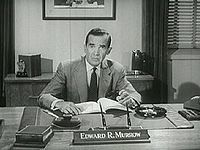 Murrow had complained to Paley he could not continue doing the show if the network repeatedly provided (without consulting Murrow) equal time to subjects who felt wronged by the program. See It Now's final broadcast, "Watch on the Ruhr" (about postwar Germany), aired July 7, 1958. Three months later, on October 15, 1958, in a speech before the Radio and Television News Directors Association in Chicago, Murrow blasted TV's emphasis on entertainment and commercialism at the expense of public service. [D]uring the daily peak viewing periods, television in the main insulates us from the realities of the world in which we live. If this state of affairs continues, we may alter an advertising slogan to read: Look now, pay later. The harsh tone of the Chicago speech seriously damaged Murrow's friendship with Bill Paley. Before his own death, Friendly said that the RTNDA address did more than the McCarthy show to break the relationship between CBS's chairman and its most-respected journalist. Beginning in 1958, Murrow hosted a talk show entitled Small World that brought together political figures for one-to-one debates. After contributing to the first episode of the documentary series CBS Reports, Murrow took a sabbatical from summer 1959 to mid-1960, though he continued to work on CBS Reports and Small World during this period. Friendly, executive producer of CBS Reports, wanted the network to allow Murrow to again be his co-producer after the sabbatical, but he was eventually turned down. Murrow's last major TV milestone was reporting and narrating the CBS Reports installment "Harvest of Shame," a report on the plight of migrant farm workers in the United States. Directed by Friendly and produced by David Lowe, it ran in November 1960, just after Thanksgiving. On September 16, 1962, Murrow introduced educational television to New York City via the maiden broadcast of WNDT, which became WNET. Murrow resigned from CBS to accept a position as head of the United States Information Agency, parent of the Voice of America, in 1961. President John F. Kennedy offered Murrow the position, which he viewed as "a timely gift." CBS president Frank Stanton had reportedly been offered the job but declined, suggesting that Murrow be offered the position. Murrow's appointment as head of the United States Information Agency was seen as a vote of confidence in the agency, which provided the official views of the government to the public in other nations. The USIA had been under fire during the McCarthy era, and Murrow brought back at least one of McCarthy's targets, Reed Harris. Murrow insisted on a high level of presidential access, telling Kennedy, "If you want me in on the landings, I'd better be there for the takeoffs." However, the early effects of his cancer kept him from taking an active role in the Bay of Pigs planning. He did advise the president during the Cuban Missile Crisis but was ill at the time the president was assassinated. Asked to stay on by President Lyndon B. Johnson, Murrow did, so but resigned in early 1964, citing illness. Murrow's celebrity status gave the agency a higher profile which may have helped it earn more funds from Congress. His transfer to a governmental position did lead to an embarrassing incident shortly after taking the job, when he was compelled to ask the BBC not to show Harvest of Shame, which had been included in a collection of U.S. network television documentaries made available to other countries by the USIA. Murrow received "Special" George Polk Awards in 1951 and 1952. He won the 1956 Emmy Award for "Best News Commentary," one of nine he received during his years in broadcasting. In 1964, Murrow was awarded the Presidential Medal of Freedom. He was made an honorary Knight Commander of the Order of the British Empire by Queen Elizabeth II on March 5, 1965, and received similar honors from the governments of Belgium, France, and Sweden. After Murrow's death in 1965, Edward R. Murrow Center of Public Diplomacy was established at Tufts University's Fletcher School of Law and Diplomacy. Murrow's library and papers are housed in the Murrow Memorial Reading Room that also serves as a special seminar classroom and meeting room for Fletcher activities. The Center awards Murrow fellowships to mid-career professionals who engage in research at Fletcher, ranging from the impact of the "new world information order" debate in the international media during the 1970s and 1980s, to telecommunications policies and regulation. Many distinguished journalists, diplomats, and policymakers have spent time at the center, among them the late David Halberstam, who worked on his Pulitzer Prize-winning book, The Best and the Brightest, as a writer-in-residence in the early 1970s. Veteran journalist Crocker Snow, Jr. was named director of the Murrow Center in 2005. In 1971, the RTNDA established the Edward R. Murrow Award, honoring outstanding achievement in the field of electronic journalism. There are two other awards also known as the "Edward R. Murrow Award." During the 1950s, Murrow and his CBS colleague Walter Cronkite had not admired one another's broadcasting styles, which differed drastically. Nonetheless, in a 1998 retrospective produced by CBS for the A&E program Biography, Cronkite said of Murrow, "He's the head of the parade, he's the pinnacle of the pyramid. He led the way." "If we confuse dissent with disloyalty—if we deny the right of the individual to be wrong, unpopular, eccentric or unorthodox—if we deny the essence of racial equality, then hundreds of millions in Asia and Africa who are shopping about for a new allegiance will conclude that we are concerned to defend a myth and our present privileged status. Every act that denies or limits the freedom of the individual in this country costs us the… confidence of men and women who aspire to that freedom and independence of which we speak and for which our ancestors fought." "We will not walk in fear, one of another. We will not be driven by fear into an age of unreason if we dig deep in our history and doctrine and remember that we are not descended from fearful men, not from men who feared to write, to speak, to associate and to defend causes which were, for the moment, unpopular. We can deny our heritage and our history, but we cannot escape responsibility for the result. There is no way for a citizen of the Republic to abdicate his responsibility. As a nation we have come into our full inheritance at a tender age. We proclaim ourselves, as indeed we are, the defenders of freedom, wherever it continues to exist in the world, but we cannot defend freedom abroad by deserting it at home." About television: "This instrument can teach, it can illuminate; yes, and it can even inspire, but it can do so only to the extent that humans are determined to use it to those ends. Otherwise it is merely wires and lights in a box." "The fact that your voice is amplified to the degree where it reaches from one end of the country to the other does not confer upon you greater wisdom or understanding than you possessed when your voice reached only from one end of the bar to the other." Good Night, and Good Luck., a 2005 Oscar-nominated film directed and co-written by George Clooney about the conflict between Murrow and anti-communist Senator Joseph McCarthy and the Senate Permanent Subcommittee on Investigations as well as the retaliation and intimidation that he and other newsmen suffered by going against McCarthy and the corporations and government institutions that supported him. Most of this took place on Murrow's show See It Now. Murrow was portrayed by actor David Strathairn, who received an Oscar nomination. In 1986, HBO broadcast the made-for-cable biographical movie, Murrow, with Daniel J. Travanti in the title role, and Robert Vaughn in a supporting role. Murrow played himself in the 1960 film, Sink the Bismarck! recreating some of the wartime broadcasts he did from London for CBS. ↑ Mangesh Hattikudur, What Richard Nixon and James Dean had in common. CNN.com. Retrieved January 31, 2008. ↑ New York Times, Edward R. Murrow, Broadcaster And Ex-Chief of U.S.I.A., Dies. Retrieved December 11, 2007. ↑ State Library of North Carolina, Edward R. Murrow. Retrieved May 21, 2008. ↑ PBS, Edward R. Murrow, American Masters. Retrieved March 28, 2008. ↑ Washington Post, Reed Harris Dies. Did Battle With Sen. Joseph McCarthy. Retrieved May 28, 2008. ↑ Ford Fiftieth Anniversary Show, CBS and NBC, June 1953, "Conclusion" in A.M. Sperber, Murrow: His Life and Times. (Freundlich Books, 1986). ↑ See It Now March 9, 1954. ↑ Turn off your TV, Radio and Television News Directors Association (RTNDA) Convention Speech. Retrieved May 21, 2008. Edwards, Bob. Edward R. Murrow and the Birth of Broadcast Journalism. John Wiley & Sons, 2004. ISBN 0471477532. Friendly, Fred W. Due to Circumstances Beyond Our Control… Three Rivers Press, 1999. ISBN 978-0812931365. Kendrick, Alexander. Prime Time: The Life of Edward R. Murrow. New York: Little, Brown and Company, 1969. Murrow, Edward R., and Ed Bliss. In Search of Light: The News Broadcasts of Edward R. Murrow. New York: Da Capo Press, 1997. ISBN 978-0306807626. Persico, Joseph E. Edward R. Murrow: An American Original. Da Capo Press. 1997. ISBN 978-0306807961. Seib, Philip. Broadcasts from the Blitz: How Edward R. Murrow Helped Lead America into War. Potomac Books, 2006. ISBN 978-1597970129. 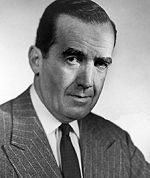 History of "Edward R. Murrow"
This page was last modified on 22 September 2017, at 20:23.